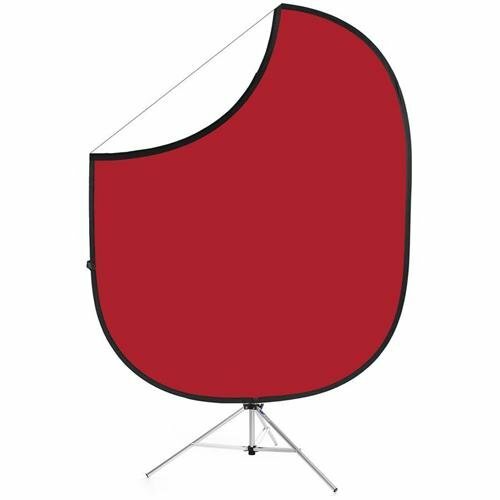 Add a level of control and professionalism to your photographic endeavors with a 5 x 6 ft. Matador Red/White Collapsible Stand Kit from Savage. When confronted with a busy or unsightly photo location, it's great to have the option of shooting with your own background. The collapsible background has a steel spring sewn into the perimeter that holds the fabric tight when open, and collapses to 1/3 the full size when folded. For versatility, the background is reversible, and offers the photographer two backdrop choices. Easy to setup, the background has touch-fasteners for hanging vertically or horizontally, and is easily clipped to the included 8' stand, too. When not in use, the background may be stored in the included carry bag.